Pedal power: The Nilgiris tour means covering 100-120km every day. 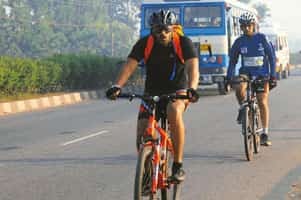 If you think you’re up to it, you’ll need to make a donation of Rs12,000 to the RideACycle Foundation, a not-for-profit advocacy group promoting sustainable transport which takes care of accommodation, food, support, medical care, et al. In addition, you’ll need to deposit between Rs4,000 and Rs6,000, depending on sponsorships snagged, to confirm your place on the tour. The tour begins on 15 December with a briefing. Click here for details.